Have you ever wanted something? I don’t mean ‘wish’. I mean you wanted to change a circumstance or reach a goal? In those circumstances there are only two options. There’s do or don’t, there is no try! It sounds hard and condemning, but it’s the absolute truth! We tend to want to give marks for effort, but when it comes right down to it, it’s what you do that brings the desired end result, not what you know you should do nor what you think you might try! We can put on a good show for others. Look like we’re doing what’s right. But that’s not where it counts. It’s what you do behind the scene, when nobody is looking (except for God of course who sees all!). That’s where it’s life changing! It’s what I do each day, in the privacy of my home, the thoughts I allow myself to think, the self-control I use, the actions I constantly repeat that set the course of my life! Whatever it is that you desire, you set the course! work in order for you to ‘sail’ toward that destination! work to keep your mind stayed on Him and His Word! work to enter into His rest! work to walk in love! You have the enabler living on the inside of you – Jesus, the greater one, the world overcomer residing inside of every born-again believer! The amplified version spells that out a little more, but we don’t want to miss it!! That’s what we have to do!! Settle some things this week! 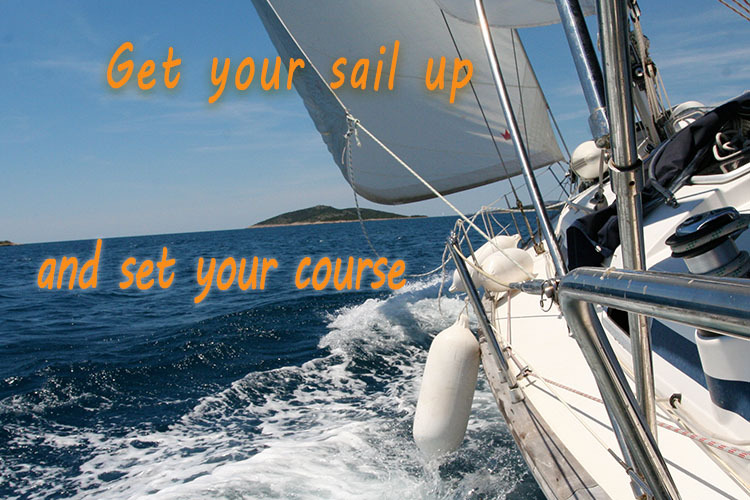 Get your sail up and set your course straight! I’m praying for you!! I descoverd this site this morning I was reading the Bible and was led here. What a blessing the church has been to me. I think about the church family all the time and I am continually talking about the wonderful church that I attend in Ontario . You have all been a wonderful influence in my life. Thank you blessings to you.